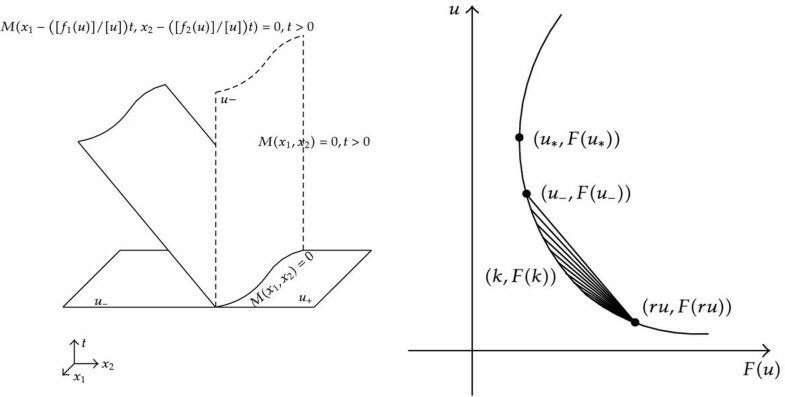 This paper is concerned with the structure of the weak entropy solutions to two-dimension Riemann initial-boundary value problem with curved boundary. Firstly, according to the definition of weak entropy solution in the sense of Bardos-Leroux-Nedelec (1979), the necessary and sufficient condition of the weak entropy solutions with piecewise smooth is given. The boundary entropy condition and its equivalent formula are proposed. Based on Riemann initial value problem, weak entropy solutions of Riemann initial-boundary value problem are constructed, the behaviors of solutions are clarified, and we focus on verifying that the solutions satisfy the boundary entropy condition. For different Riemann initial-boundary value data, there are a total of five different behaviors of weak entropy solutions. Finally, a worked-out specific example is given. Multidimensional conservation laws are a famous hard problem that plays an important role in mechanics and physics [1–3]. For Cauchy problem of multi-dimensional scalar conservation laws, Conway and Smoller  and Kruzkov  have proved that weak solution uniquely exists if it also satisfies entropy condition, and it is called weak entropy solutions. In order to further understand qualitative behavior of solutions, it is also important to investigate multi-dimensional Riemann problems. For two-dimensional case, Lindquist , Wagner , Zhang and Zheng  Guckenheimer , Zheng  among others, have discussed some relating Riemann problems. In a previous discussion, initial value contains several constant states with discontinuity lines so that self-similar transformations can be applied to reduce two-dimensional problem to one-dimensional case. The situation that initial value contains two constant states divided by a curve can not be solved by selfsimilar transformations, and Yang  proposed a new approach for construction of shock wave and rarefaction wave solutions; especially, rarefaction wave was got by constructing implicit function instead of the usual selfsimilar method. This approach can be expanded to general -dimension. In addition, multi-dimensional scalar conservation laws with boundary are more common in practical problems. Bardos et al. have proved the existence and uniqueness of the weak entropy solution of initial-boundary problems of multi-dimensional scalar conservation laws. 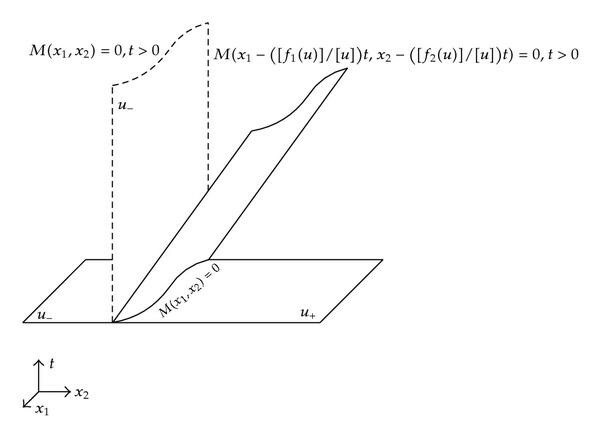 The main difficulty for nonlinear conservation laws with boundary is to have a good formation of the boundary condition. Namely, for a fixed initial value, we really can not impose such a condition at the boundary, and the boundary condition is necessarily linked to the entropy condition. Moreover the behavior of solutions for one-dimensional problem with boundary was discussed in [11–18]. However, for multi-dimensional problem with boundary, the behaviors of solutions are still hard to study. where , and are both constants, , , is a smooth manifold and divides into two infinite parts, , and and denote . In Section 2, weak entropy solution of Riemann initial-boundary value problem (1.1) is defined, and the boundary entropy condition is discussed. In Section 3, weak entropy solutions of the corresponding Riemann initial value problem are expressed. In Section 4, using the weak entropy solutions of the corresponding Riemann initial value problem, we construct the weak entropy solutions of Riemann initial-boundary value problem, and prove that they satisfy the boundary entropy condition. The weak entropy solutions include a total of five different shock and rarefaction wave solutions based on different Riemann data. Finally, in Section 5, we give a worked-out specific example. According to the definition of the weak entropy solution and the boundary entropy condition to the general initial-boundary problems of multi-dimensional scalar conservation laws which was proposed by Bardos et al. and Pan and Lin , we can obtain the following definition and three lemmas for Riemann initial-boundary value problem (1.1). where is the outward normal vector of curve . The proof for one-dimension case of Lemma 2.2 can be found in Pan and Lin's work , and the proof for -dimension case is totally similar to one-dimension case; actually the idea of the proof first appears in Bardos et al. 's work , so the proof details for Lemma 2.2 are omitted here. A piecewise smooth function with smooth discontinuous surface is a weak entropy solution to the Riemann initial-boundary value problem (1.1) in the sense of (2.1) if and only if the following conditions are satisfied. For piecewise smooth solution with smooth discontinuous surface, Rankine-Hugoniot condition (2.7), entropy conditions (2.8), (2.9) and initial value condition (2.11) are obviously satisfied, see also the previous famous works in [4, 7–9]. As in Lemma 2.2, boundary entropy condition (2.10) also holds. The proof of the converse in not difficult and is omitted here. According to Bardos et al. 's work , we have the following Lemma. If is piecewise smooth weak entropy solution of (1.1) which satisfies the conditions of Lemma 2.3, then is unique. According to the uniqueness of weak entropy solution, as long as the piecewise smooth function satisfying Lemma 2.3 is constructed, the weak entropy solution of Riemann initial-boundary value problem can be obtained. where is a certain interval can be a finite number or . Condition combines flux functions and curved boundary manifold , providing necessary condition for the convex property of the new flux function which will be constructed in formula (4.5). The convex property clarifies whether the characteristics intersect or not, whether the weak solution satisfied internal entropy conditions (2.8) and (2.9) and boundary entropy condition (2.10), In addition, Condition is easily satisfied, for example, , , then , so Condition holds. Here is a cubic curve on the plane, and it is strictly bending. Yang's work  showed that depending on whether the characteristics intersect or not, the weak entropy solution of (3.1) has two forms as follows. (iii) weak entropy solutions formed as (3.3) and (3.5) uniquely exist. The weak entropy solutions constructed here are piecewise smooth and satisfy conditions (i) and (iii) of Lemma 2.3. Now we restrict the weak entropy solutions of the Riemann initial value problem (3.1) constructed in Section 3 in region , and they still satisfy conditions (i) and (iii) of Lemma 2.3. If they also satisfy the boundary entropy condition (ii) of Lemma 2.3, then they are the weak entropy solutions of Riemann initial-boundary value problem (1.1). Based on different Riemann data of and , the weak entropy solutions of the Riemann initial value problem (3.1) have the following five different behaviors when restricted in region . is formed by moving along the direction of the vector , and the outward normal vector of curve is equal to . According to the angle between and , the solution restricted in has two behaviors as follows. 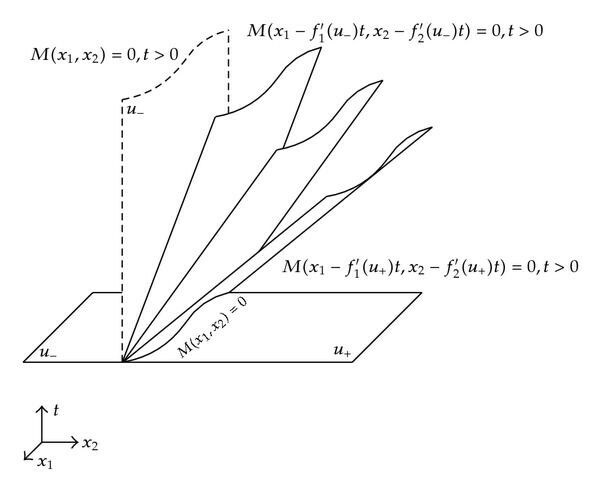 The shock wave solution of Case 2.
is formed by moving along the direction of the vector , is formed by moving along the direction of the vector , and the outward normal vector of curve is equal to . Thus, . According to the angles between , , and , the solution restricted in has three behaviors as follows. where is the implicit function which satisfies (3.6). The rarefaction wave solution of Case 3.
and thus we verify the above five solutions all satisfying the boundary entropy condition (4.10). and so the boundary entropy condition (4.10) is verified. When , , the shock wave solution is formed as (4.3). In this case, , so the boundary entropy condition (4.10) is naturally verified. When , , the rarefaction wave solution is formed as (4.7). In this case, , and so the boundary entropy condition (4.10) is naturally verified. In summary, we have the following theorem. (v)if and , the solution of (1.1) is constant state and has a form as (4.9). In addition the solutions formed as (4.2), (4.3), (4.7), (4.8), and (4.9) uniquely exist. (v)if and  , the solution of (1.1) is shock wave and has a form as (4.3). The approach here for two-dimensional Riemann initial-boundary problem can be expanded to the case of general -dimension. where , , , and it denotes . Since , we easily get , and condition holds. According to the different data of and , the behavior of the solution to Riemann initial-boundary problem (5.1) has a total of five situations; they can be described by the following five cases: (i) , ; (ii) , ; (iii) , ; (iv) , ; (v) , . Since is the solution of implicit function, we still need to verify satisfying the following three conditions: (a) ; (b) ; (c) . In fact, according to the next proposition, the above three conditions can be easily verified, and the detail the omitted here. where must be one root of (5.13). In fact, . Equation (5.13) at most has one real root; but is its real root, thus , and the proposition holds. where has the same form as (5.10). This work is supported by the National Natural Science Foundation of China (10771087, 61078040), the Natural Science Foundation of Guangdong Province (7005948).